Godolphin’s big Investec Derby hope True Story failed to sparkle when only third in the Dante Stakes on easy ground at York on May 15. The 8/13 favourite, who was ridden for the first time by Kieren Fallon, could finish only third behind Kevin Ryan’s The Grey Gatsby in the Group 2 classic trial and was pushed out to 16/1 (from 11/2 second favourite) for the The Derby on Saturday, June 7th. 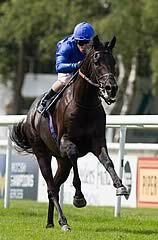 True Story's trainer, Saeed bin Suroor commented: "True Story was travelling really well but then got checked by the winner inside the final furlong. "Kieren told me the ground did not help True Story. Good, faster ground will be better and the distance at Epsom, a mile and a half, will also be good for this horse. We now head to Epsom for the Investec Derby." Kieren Fallon said: "True Story likes top of the ground and hopefully it will be fast at Epsom. The ground is important to this horse - we have said it all along. He had to run somewhere. The ground is on the slow side today. "He does not have much to make up and, if he gets his ground, we will be happy with him. "He was fine on the bend. When one goes off (in front) like that, you don't know whether they are going to stay there. I just had to ask True Story a bit sooner than I would have liked. "It was only a trial today - all we wanted to do was make sure he relaxed and was going the right way - which I think he has done."